Is there a more tantalising fragment in the history of music than Schubert’s late ‘Quartettsatz’ (Quartet Movement) D 703? Why he didn’t complete the (presumably) three remaining movements is not known. It was not a case of untimely death – the movement was written in 1820, eight years before his demise. No; more than likely, Schubert found himself temporarily unsure how to continue, and was then forced to work on other things. A clue might be that, between 1819 and 1823, he worked on, and in some cases completed, no less than nine operas. So the missing three movements of the quartet become more explicable. But what a movement this remaining one is! 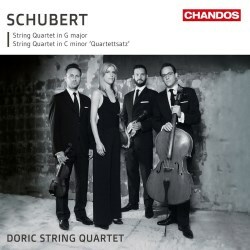 The brilliant young Doric Quartet go for broke, using huge contrasts of dynamics, tone and articulation to extract all the underlying drama and tension in this music. The opening tremolos, marked pianissimo, seem to come from the far distance and suddenly erupt before us in angry minor harmonies. All the way through, the Doric respond to the ebb and flow of emotions, and the kaleidoscopic interplay of themes. Quite a roller-coaster, but my word, does it hold the attention. All those qualities persist into the late G major quartet, but placed in a far larger musical landscape. This is a gigantic work from the final phase of Schubert’s short life; the first movement alone is twenty-two minutes plus, giving it Brucknerian proportions. Interesting comparison; try the old Innocent Ear game with a musically savvy friend who hasn’t heard the piece before. Listen to the first minute or so and ask ‘who’s the composer?’ Anton Bruckner would be a highly intelligent guess, with the harmonic side-slips, the whispering tremolandos and the first violin’s quiet fanfares. Magical stuff, and the Dorics bring the same sense of mystery here as they do to the opening of the Quartettsatz. The danger in their very intense approach might be the risk of overstretching the movement’s inner contrasts, thus undermining its structure and flow. But I feel they have wholly avoided that danger by their sensitivity to the importance of the more relaxed moments, chiefly those associated with the slow Viennese waltz of the second main theme. Notable, as with all the best chamber groups, is the way that the individual players are each able to project their personalities powerfully when required, while maintaining a secure sense of inner ensemble. The uneasy Andante un poco mosso is wonderful; the extraordinary outburst around 3:15 (track 3) dissolves into a moment of regret whose pathos is underlined by a momentary use of senza vibrato – hauntingly effective and affecting. This is a strangely restless movement, though Schubert finally relents and allows the music to end comfortingly in the major key – even if the ‘comfort’ sounds provisional! The Scherzo seemed highly seasonal to me (it’s very cold outside as I write this), with its teeth-chattering main theme and foot-stamping rhythms. The diffident theme of the trio took a moment to establish itself, but soon did so, with some more exquisitely soft playing from the quartet. The finale has something of the diabolic quality that we find in the equivalent movement of the ‘Death and the Maiden’ quartet; but Schubert’s inability to make up his mind whether he’s in the major or the minor key – sometimes seemingly switching from one to the other and back within the same bar – seems well-nigh schizophrenic. Thank-you, recording team, for completing a superb effort by letting us hear the resonating strings following that final chord. The Dorics have lived through every bar of this music, and make it come alive for us in the same way. They have clearly considered the character and meaning of every phase and every phrase of these masterpieces, and play with technical assurance, intelligence and imagination. Quite a ride!